There's probably a lot of things you dreamed about when considering a boat purchase. Weekends on the lake, afternoons on the ocean, sailing across the seas admiring the marine life, and making memories with your friends and family. You probably considered the cost of the boat, fuel, and maintenance. But, did you consider what you would do with the boat when you're weren't using it? Regardless of if you need to store the boat between weekend adventures, for several months when the temperature makes it too cold to take it out or for a longer period of time until you can sell or pass it down to your son or daughter, there are many things to consider when deciding how to store your boat. Chances are you won't want to park it on your front lawn. Not only does it create an eyesore for their neighbors, many neighborhoods in the Highlands area have ordinances against it. Additionally, outdoor storage can take a toll on the water craft. Therefore, it's important to find safe, affordable, and convenient storage solutions. One last ride – We recommend taking your boat out for one last spin before putting it away. This will help you identify any maintenance or cosmetic issues that need to be taken care of. Most of the time, the sooner issues are found, the easier they can be fixed. A final ride on the boat will ensure that your boat is in tip top shape when you store it. Clean it – Give the boat a thorough cleaning from top to bottom and be sure to leave time for the boat to dry before you put it away. Also be sure to clean out the inside of the boat. Empty the cabinets and refrigerator to make sure that food doesn't spoil and make a mess or attract rodents. Consider using mildew control bags to ensure your boat smells fresh when you want to take it out again. Fill the tanks – Most boat experts recommend storing the boat with a full tank of gas and with gas stabilizer to keep condensation away. Also check the oil, replace filters, flush coolants, and add anti-freeze. All the maintenance you do on a regular basis, you should do one last time before storing the boat. With all the work it takes it store your boat, you can rest easy knowing that it's well taken care of at Vines Storage. 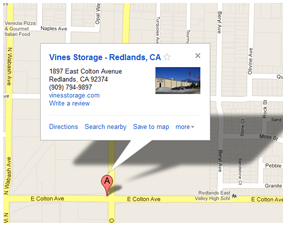 To learn more about our services and storage options, call the Vines Storage office today.